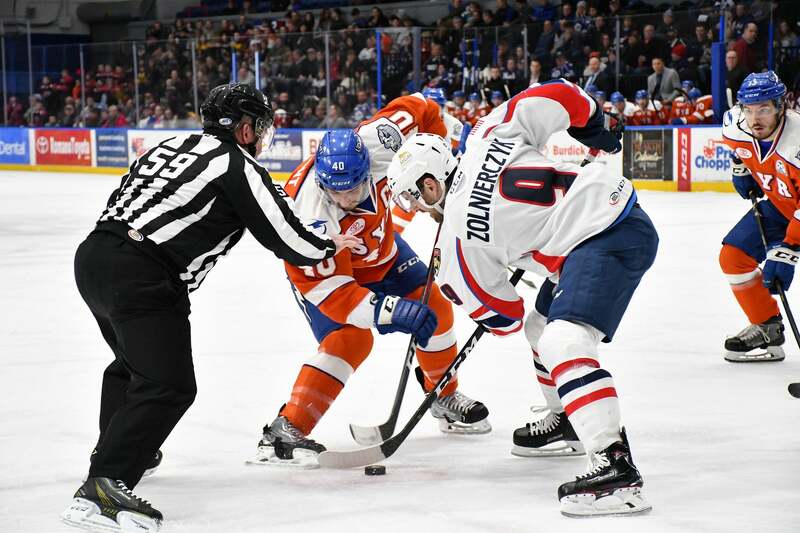 SYRACUSE, N.Y. - The Springfield Thunderbirds (20-15-6-4) could not capitalize on a glorious chance in the late stages of the middle period, and the Syracuse Crunch (24-13-2-1) skated away with a 6-1 win on Friday night at the War Memorial Arena in Syracuse. The Crunch took little time to jump to the early lead on their home ice, and on a 2-on-1 rush just 4:18 into the period, Boris Katchouk took a cross-ice feed from Gabriel Dumont and beat Sam Montembeault for his seventh of the season to make it a 1-0 Syracuse lead. After both teams took penalties to put the game into a 4-on-4 orientation, the Crunch again took advantage of a Thunderbirds lapse in transition defense. Newly acquired defenseman Jan Rutta raced up the right wing and, from the circle, snapped off a low wrister the sneaked through Montembeault's blocker and gave the Crunch a 2-0 lead at the 11:38 mark. The Thunderbirds' power play, though, made sure they would cut the lead in half before the period came to an end. After Dumont went to the box for the second of three times in the first period, Anthony Greco scooped up a loose puck along the right wing goal line off a Jacob MacDonald point shot. With goaltender Eddie Pasquale scrambling back into position, the Thunderbirds All-Star winger banked it in to make it a 2-1 game at 16:50. The goal was Greco's 18th of the 2018-19 season. ﻿The second period began cautiously, with the two teams combining for just nine shots in the first ten minutes of the middle stanza. Syracuse would get two power play opportunities, but the Springfield penalty kill was successful both times it was pressed into duty. Springfield then got a glorious chance to get back into the game when Andy Andreoff knocked Harry Zolnierczyk down to the ice in the neutral zone on an interference call. With Zolnierczyk injured on the play, Andreoff was given a five-minute major and game misconduct. Pasquale and the Syracuse killers preserved the 2-1 lead into the second intermission, and they completed the job with 2:31 of successful killing time to start the third. Less than two minutes after that, the Crunch put the game out of reach as Taylor Raddysh finished off a give-and-go with Katchouk, making it 3-1 at 4:17 of the third period. With the momentum firmly on their side, Syracuse put the game away with three more goals in three different fashions. Alex Volkov potted a 2-on-1 rush at even strength to make it 4-1 at 10:30. 1:01 later, Alex Barre-Boulet tallied his league-high 12th power play goal of the season to make it 5-1. Brady Brassart added the Crunch's league-leading 10th shorthanded goal in the closing minutes to round out the scoring. Pasquale made 28 saves in the victory. The Thunderbirds' final home game before the AHL All-Star Classic takes them to Providence on Saturday night for a 7:05 p.m. puck drop against the Providence Bruins. It is already the eighth of 14 meetings this regular season before the two teams.